Samantha was always the brighter side of life, a caring, loving and devoted individual with the biggest heart and smile many people will ever be fortunate enough to meet. Before this disease took hold, she lived an ordinary happy childhood, and was enjoying her teenage years with her life stretched out before her. Leukaemia changed Samantha’s life, her dreams and her family in an unimaginable way, and nothing will ever be able to replace such a loss, but we hope that through this charity, Samantha’s name will live on and other children will not have to suffer to the extent that Samantha did. 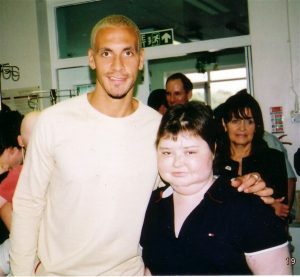 In August 2000, Samantha aged just 14 years was diagnosed with Acute Lymphoblastic Leukaemia (ALL) and admitted to The Royal Manchester Children’s Hospital to begin chemotherapy immediately. At this stage, it was believed she had 80% chance of survival and Samantha was determined to battle, yet one week later, disaster struck when Samantha was found to have a rare chromosomal abnormality – Philadelphia Translocation – and her chance of survival was then estimated to be 20%. The immediate goal was for Samantha to achieve remission within 1 month, and then start intensive chemotherapy. The only chance of a complete cure was for Samantha to have a Bone Marrow Transplant (BMT). The search was on for a donor, and her sister, Natalie was found to be a perfect match. Chemotherapy was very hard and Samantha lost her beautiful long hair for the first time. She was very ill but her spirit shone through although she was devastated inside. Samantha needed a transplant sooner rather than later and a date that December was set. Following intensive chemotherapy and total body irradiation at The Young Oncology Unit at Christie hospital, Samantha received her transplant just before Christmas of that year. 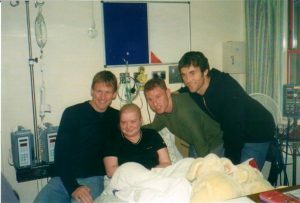 Again, she was very ill and was in isolation on the Bone Marrow Unit at Pendlebury Children’s Hospital for four weeks. Upon her return home, life was difficult as it was necessary for Samantha to spend a further 5 months in isolation, cut off from her family and friends when she most needed them, all the time being dependent on drugs to boost her immune system and prevent her from rejecting the transplant. She lost her hair for a second time. 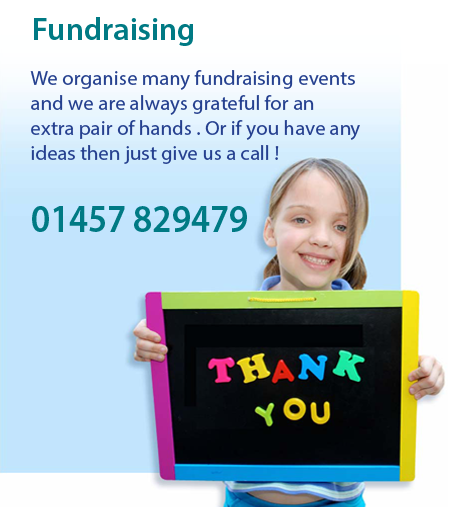 By June 2001, Samantha’s life was beginning to return to normal and the following September she returned to school to continue with her GCSE’s to fulfil her dreams of becoming a Children’s Nurse. 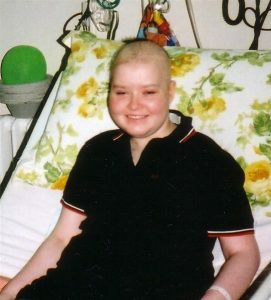 Just as Samantha was settling back into the routine of teenage life, the leukaemia returned a week after her 16th birthday in November 2001. We were all devastated. As it was only 11 months after her transplant, Samantha’s immune system was still very weak; because of this, the options for treatment were very limited. We were told that a 4-week course of gentle chemotherapy was her only option. Towards the end of this treatment, catastrophe struck when Samantha started having seizures and it was thought she had leukaemia on the brain and was given days to live. After various tests, this proved not to be the case. The cause was uncertain but likely to be a brain infection. Following seizures and respiratory arrest, Samantha was admitted to intensive care and we thought this was the end as she was so severely ill and it was 4 days before any sign of improvement occurred, we sat by her side night and day hoping and praying she would pull through. This situation was all the more heartbreaking as Samantha was found to be in complete remission, meaning although she was leukaemia free, her life was in grave danger because of what was occurring in her brain. Samantha was then given a new ‘wonder drug’- Glivec to keep her in total remission although we were told this would not hold the leukaemia for long. On Christmas Eve, Samantha developed a pneumothorax (collapsed lung) and needed surgery urgently to relieve her pain. She also needed a brain biopsy to obtain brain tissue for analysis and following a 4-hour operation, she returned to intensive care once more. Having been there before we were positive that our precious daughter would pull through. Again we kept vigil by her bedside, and on New Years Day Samantha was well enough to come off the ventilator and was readmitted to the ward. She was also losing her hair for the third time! As a result of the operation to take brain tissue for diagnosis of the abscesses, Samantha lost the ability to walk, talk and eat when she had a stroke. Intensive Physiotherapy ensued and she made a miraculous recovery once again, and becoming the Samantha we all knew and loved. She amazed doctors with her strength and smile at all times and they likened her to a ‘cat with 9 lives’! After three months rehabilitation in hospital, Samantha returned home in March 2002, just beginning to learn to walk again, needing a wheelchair to travel any distance and relocating her bedroom downstairs. She was determined and looking forward to regaining her former life. The threat of further seizures was very worrying and it became necessary to carry drugs everywhere Samantha went to stop the seizures quickly before they caused further damage. On 17 May, Samantha relapsed for a second time and we were shattered. The only way forward was experimental drugs, these where called upon in a desperate attempt to save her life. With the use of high dose steroids and these experimental drugs, Doctors stabilized Samantha and in July, a trip to the famous Eastenders TV set was arranged for her, and she enjoyed a few days worry free. But as ever, nothing was plain sailing, and on our return to the hotel from the set, Samantha suffered several seizures. This was an incredibly frightening time as the seizures were uncontrollable, and she was rushed to A&E at Barnet General Hospital. At this point, we were told there was nothing more that could be done for Samantha. We waited for her to stabilize then we were in a desperate race against time to get her home. The Ambulance blue lighted up the M1 and it was feared that she wouldn’t make the journey, but being the courageous girl she was, Samantha was not ready to give up, and spent the next 2 months in Pendlebury Children’s Hospital surrounded by her family and Friends fighting until the very last day. After incurring serious chest problems over a few days Samantha stopped breathing and whilst every attempt was made to resuscitate her, she was gone. Samantha received her wings on September 26th 2002. We never thought this day would come. We were shocked at the speed of her deterioration and devastated at the ultimate loss of our precious daughter. Life is now unrecognizable. We tried so hard to save Samantha and she tried so hard to stay with us. Samantha’s courage through adversity deserves recognition and The Samantha Jones Trust is our way of spreading some of the light that Samantha shone on us. Leukaemia does not have to mean the end, life should carry on, and here Samantha’s is as she gives us the power to carry on and help others.